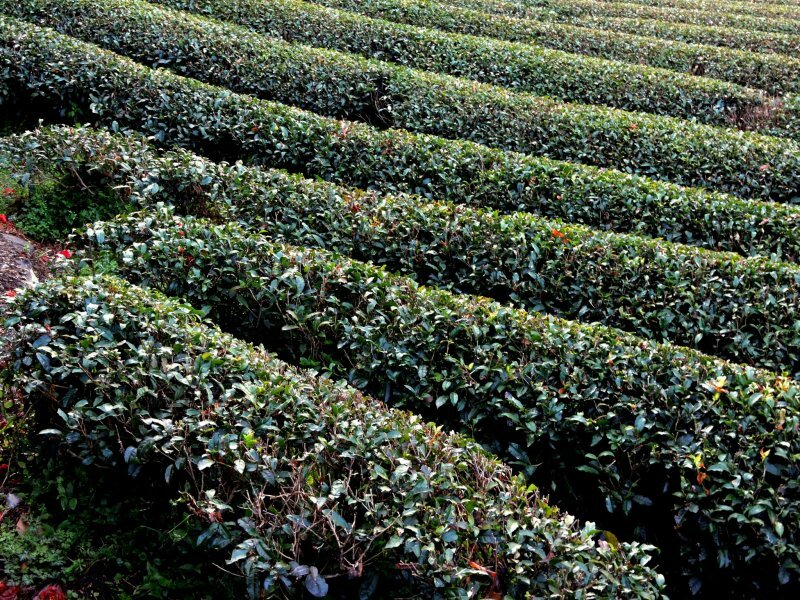 Have you ever visited a tea plantation? Drinking green tea has many health benefits - it can fight inflammation, protect you from cell damage, increase insulin sensitivity, boost your metabolism and help with weight loss. If you come to Japan, you have the opportunity to visit the source of all this green goodness and learn about it first-hand. A short trip from Tokyo on the bullet train will take you to Shizuoka Prefecture, which is home to 40 percent of Japan’s total tea plantations. Tea grows on the mountainsides and in the foothills and valleys of this beautiful area, influencing the lifestyle, culture, and—no doubt—health, of the people who live here. 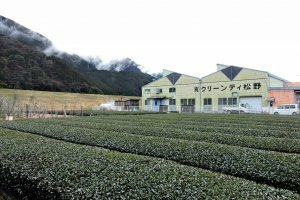 About 30 minutes drive from Shizuoka, you can find a tea processing factory named Clean Tea Matsuno, which welcomes tour groups. After we arrived, our factory guide Minowa-san led us to a green tea field next to the factory. The tea is grown organically. Beneficial insects are encouraged, and clippings from the bushes are used to mulch the roots. We could see where the stems had been trimmed and he told us the new growth would sprout from the trimmed stems. 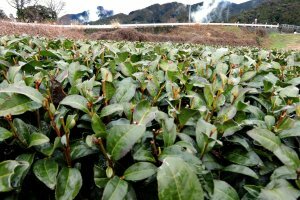 Once they begin to grow, the leaves grow fast, and the skill of the tea grower is knowing when to harvest for maximum flavor and goodness. Too early and the leaves won’t develop as much flavor, but too late and the stems harden and start to draw goodness out of the leaves to fuel the plant's growth. Next, we went into the factory to look at the processing machinery. 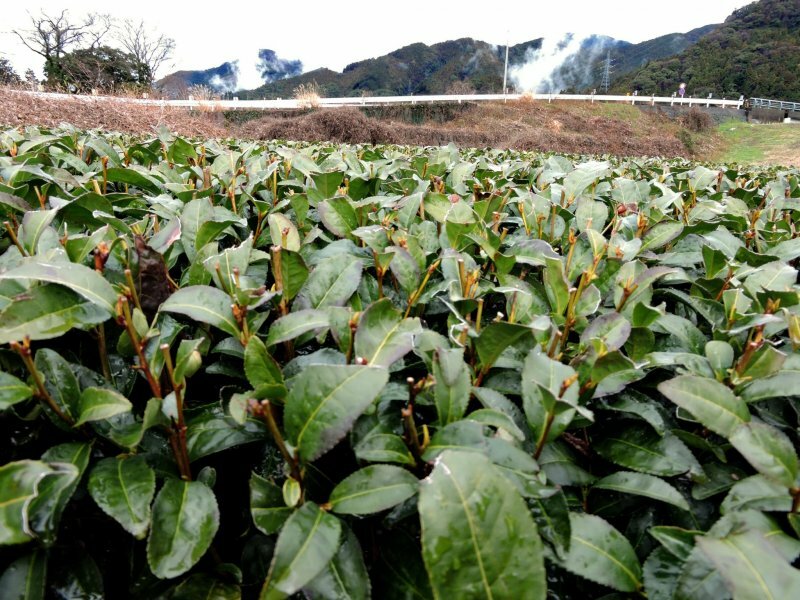 The factory can produce five tons of tea from 25 tons of fresh leaves in one day. 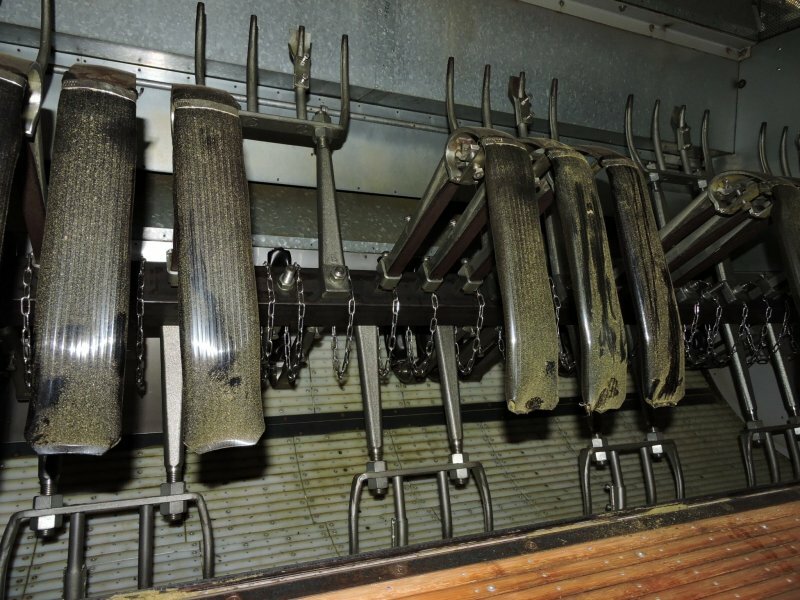 Throughout processing, factory staff constantly check and adjust the process to get perfect results. First the fresh leaves are steamed for just a few seconds, then they are rolled as they dry. The entire process takes exactly five hours. Over-processing would result in oxidation and the loss of the wonderful green color. You would have red tea instead of green tea. The final part of the tour was a tea tasting. We sampled two different teas made from the same leaves but processed differently. One was mild with lots of umami, and the other had more bitterness and a refreshing, cleansing taste. Different green teas can be paired with different foods, just as wine is. Green tea deodorizes your breath, so it is the perfect chaser to a meal that includes garlic, and an antibacterial effect helps protect your teeth from decay. May, June and October are the best times to visit because you can try your hand at tea picking, and the factory only works at those times. 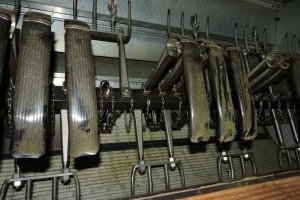 The factory can accommodate tours of up to 80 people. Reservations are necessary. 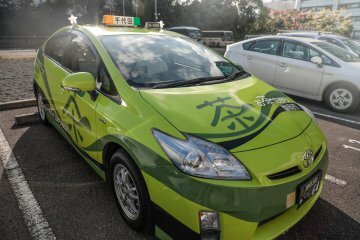 The factory is about 30 minutes by taxi or 40 minutes by bus from Shizuoka Station. 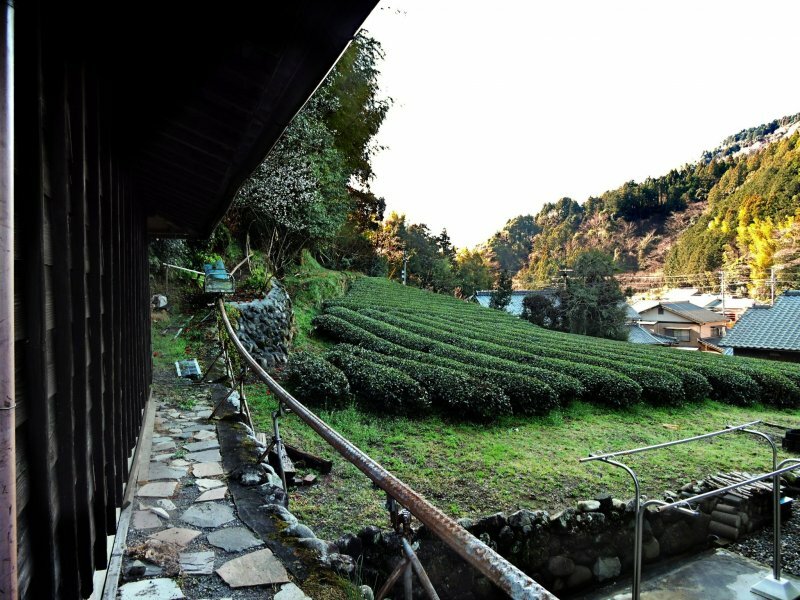 Tea plantations are usually very beautiful places, but Okakae Tea Garden Kanebun must be one of the most beautiful. We ascended the mountain by a narrow zigzagging road. Neat rows of tea bushes covered the steep slopes. 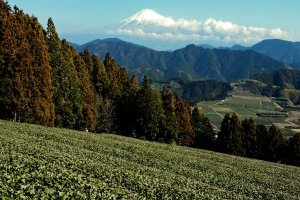 We stopped 500 meters above sea level to take photos and enjoy an iconic view of snow-capped Mount Fuji looming over the tea fields. Many photographers are drawn to this spot, arriving very early in the morning to capture sunrise views of Mount Fuji floating in a sea of clouds. Sadly the "Sea of Clouds" is dependent on the weather, and I didn’t get to witness it, but I was still thrilled by the view. Growing good tea requires plenty of rainfall and, even in the heart of summer, there is plenty of rain in the mountains. It also requires loose soil with good drainage, so the stony mountain slopes are perfect. A large contrast in daytime and night-time temperatures is also beneficial. 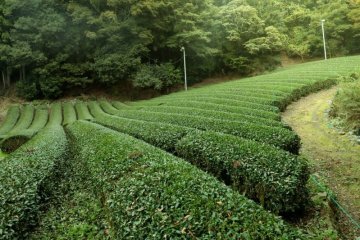 Tea is harvested three times a year. At high altitudes the first burst of growth takes place in mid-May, about 2 weeks later than in the lowlands. 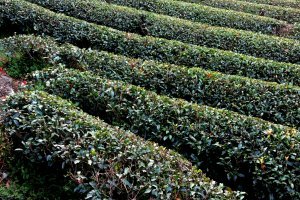 Tea is picked in June, July and November. I visited in early March when the bushes were dormant. After imprinting the view on our memory cards and our hearts, we descended to a cafe perched on the mountainside. Large windows took in the Mount Fuji and tea plantation views. Soothing, laid back music played, and we sat on tree-trunk stools at a table formed from a great trunk. Various teas and tea-making equipment were available to buy. 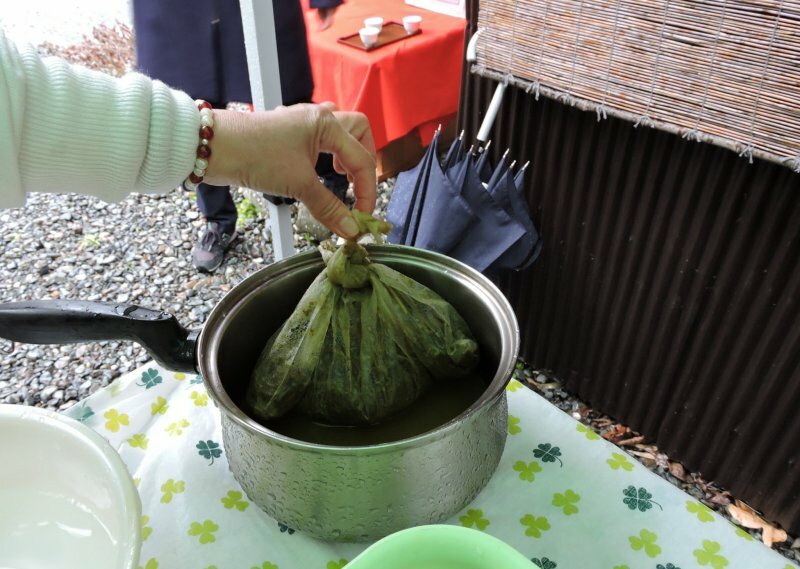 Here we learned how to properly brew green tea. Apart from the quality of the tea, the secret is in using the correct temperature of hot water – only 50 degrees for the first brewing. I’m sure low-temperature brewing must help preserve the health-enhancing substances in the leaves, but it also draws maximum umami flavor from the tea and minimizes bitterness. 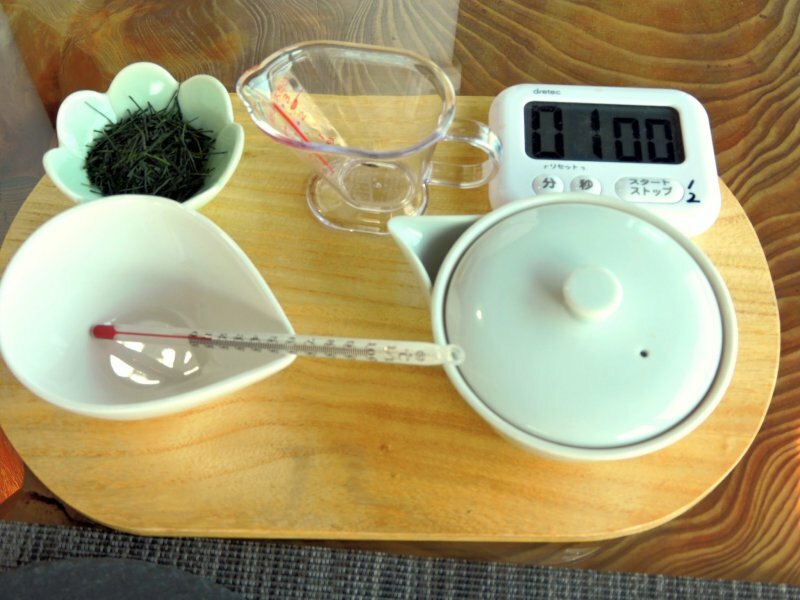 Gradually increasing the temperature, hot water is added to the same leaves several times, with the flavor of each successive brew being subtly different, yet still delicious. 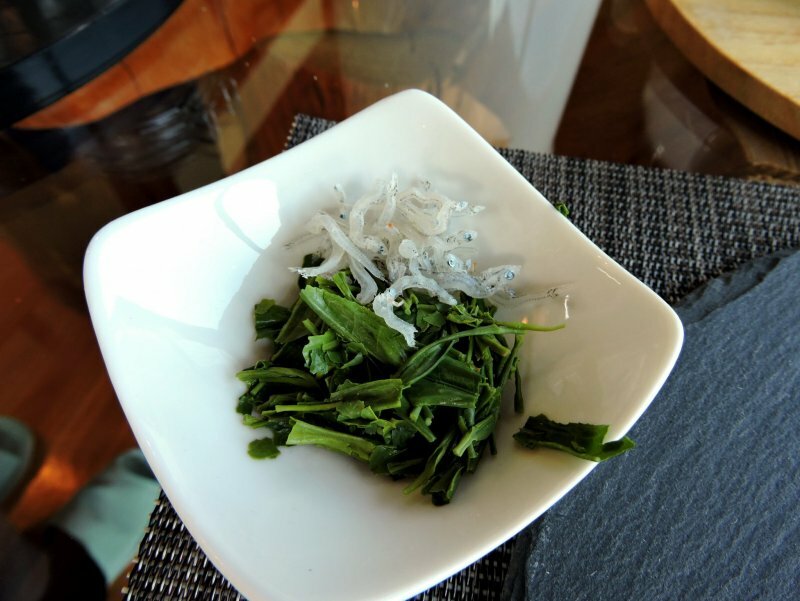 Finally, we tried eating the tea leaves with salt, dried whitebait or ponzu, a citrus-flavored soy sauce. They were tender, and tasted good, reminding me of spinach salad, although slightly more bitter. We also enjoyed some delicious handmade sweets. I have never enjoyed a cafe more! 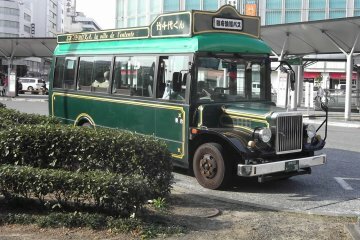 Okakae Cha-en Kanebun is about 30 minutes by taxi or 50 minutes by bus from either Shimizu or Okitsu Stations on JR Tokaido Line. The tea room is open daily, but please make a reservation before you go. Drinking green tea may actually increase your happiness levels, as it contains an amino acid named L-theanine, which has a calming effect and increases dopamine levels and alpha brain waves. So this motto may be true as well as charming! When we arrived Suzuki-san served us a delicate beverage made from tea seeds, with some pretty jelly-like sweets. After that, we walked up the road beside a mountain stream past tea fields and bamboo groves – typical mountain scenery in Japan. We crossed a slightly scary suspension bridge, picked our way through a cedar grove scattered with mossy rocks, and arrived at a tea field. 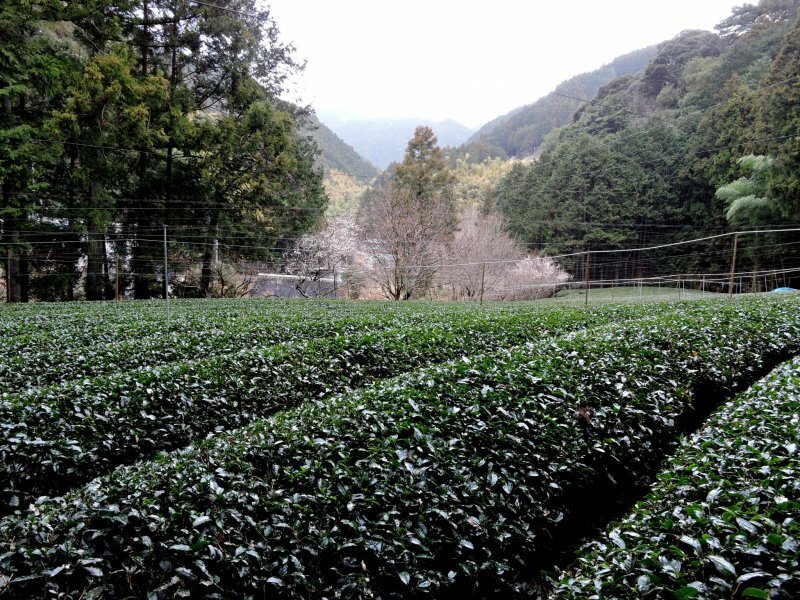 The tea being cultivated was for matcha. Wires strung from poles crisscrossed the field. When the new growth began, black netting would be hung over the wires to protect the new leaves from damage by late frosts. The shade also causes the new leaves to develop more chlorophyll, giving matcha its intense green color. The amount of health-giving amino acids also increases dramatically. Matcha is potent stuff! Returned from the field, we entered the pretty tea house, a converted stable. 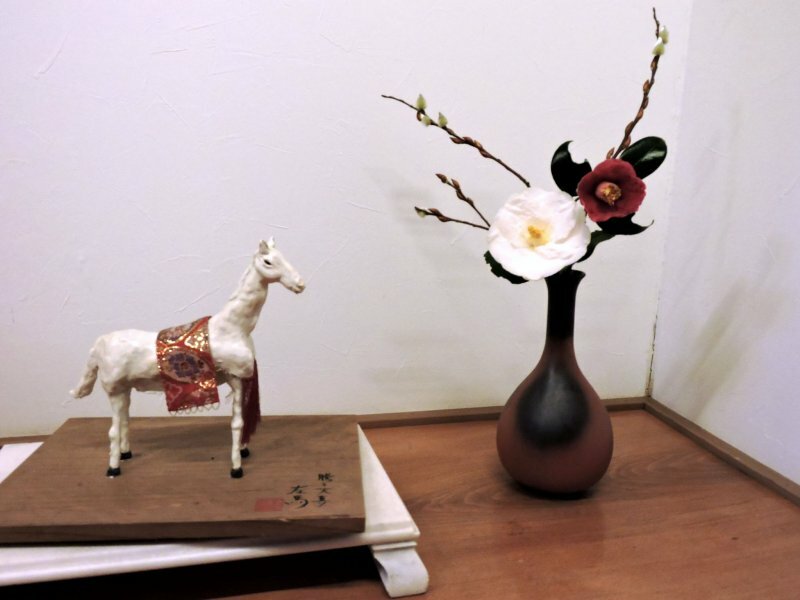 All the decorations were created by Suzuki-san and her daughters, and souvenirs of tea and handmade items can be purchased there. After another cup of tea made with salty pickled tea blossoms, it was time to do some tea dyeing. 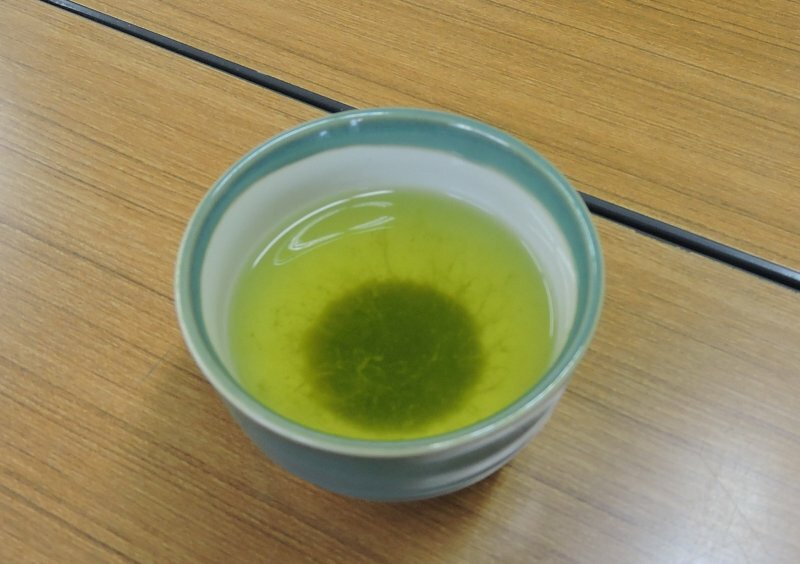 Green tea can be used to dye fabric, imparting a soft yellow color. There is a choice of a handkerchief or a drawstring bag. The pattern is created by binding sections of cloth with rubber bands. Donning an apron and rubber gloves, you dip the handkerchief in a basin of green tea. For contrast we also dipped part of it into some soft gray dye, then we rinsed it and removed the rubber bands. 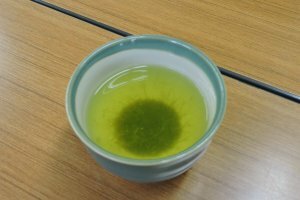 While Suzuki-san was ironing the handkerchief dry, her daughter did a tea ceremony for us, with richly flavored matcha and elegant tea sweets. 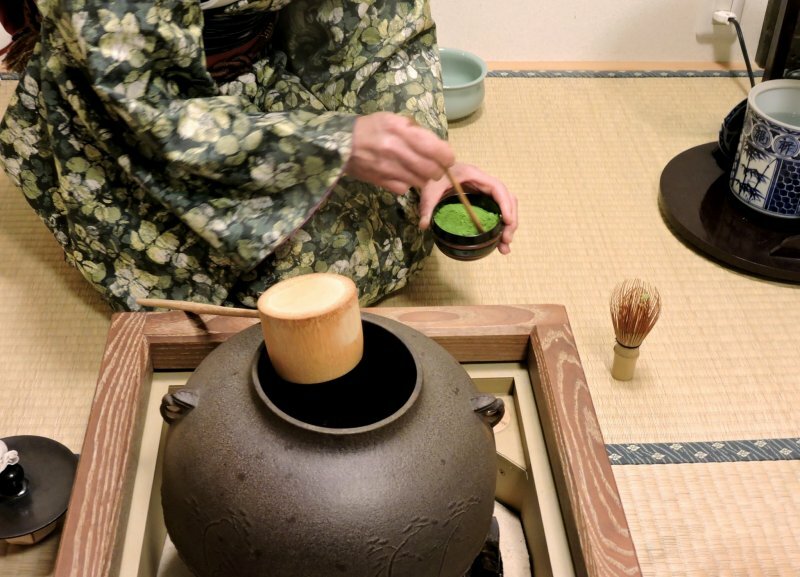 The matcha of Japanese tea ceremonies is to green tea what espresso is to coffee. The bitterness goes well with sweets. Suzuki-san returned with my handkerchief neatly packaged, and it was time to leave. 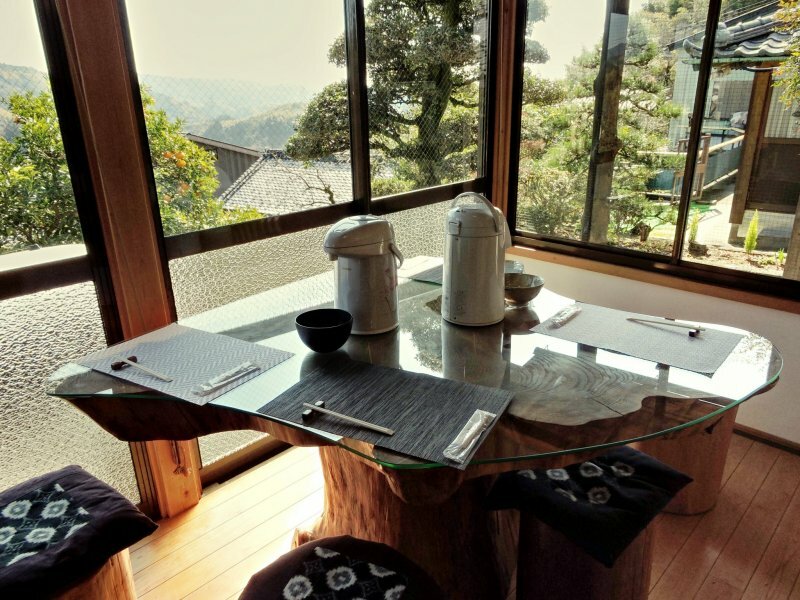 The Suzuki family honor their guests with the work of their hands – a handmade tea house, various handmade teas, handmade sweets, handmade souvenirs, even a handmade experience. 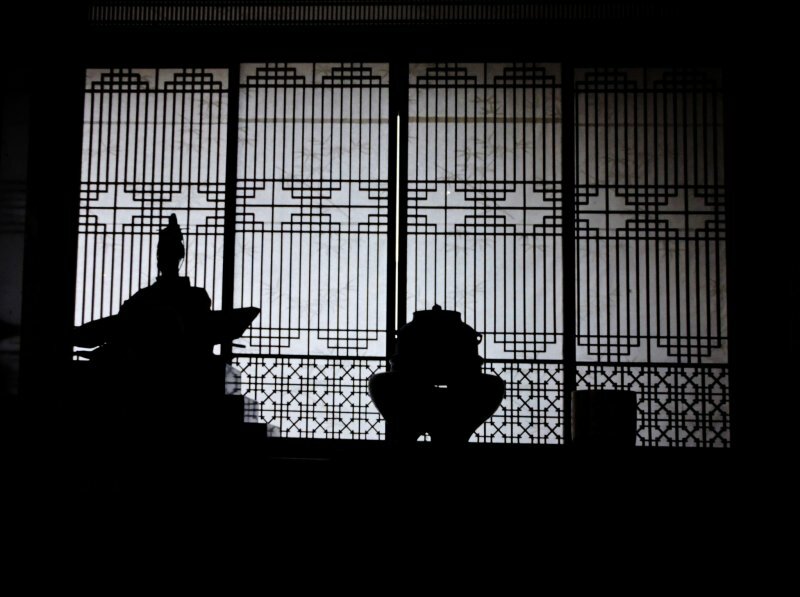 I will treasure the memory of my time at Seisho Yu-en, and the handmade hospitality of its owners. Seisho Yu-en is about 30 minutes by taxi from Okitsu Station on the JR Tokaido Line. Our kimono-clad hostess, Nishiyama-san, met us in a gravel courtyard with a large traditional style house and outbuildings on either side. 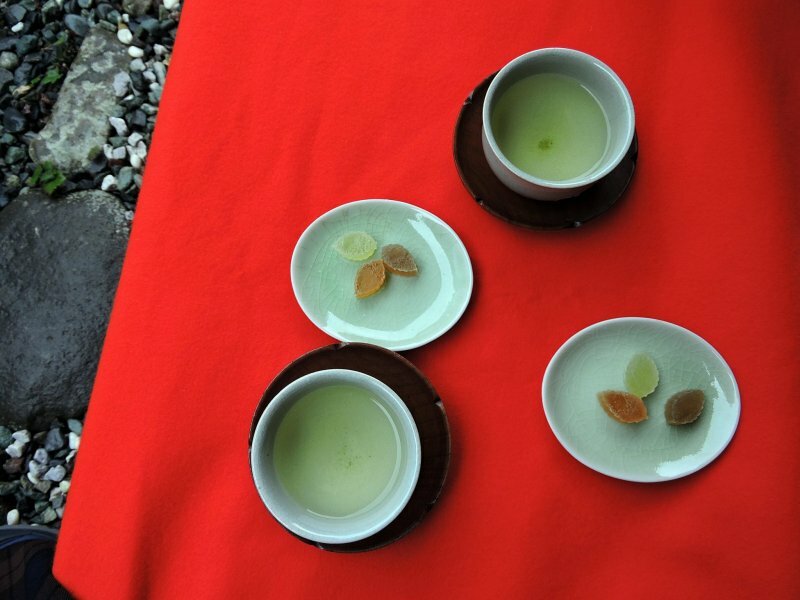 First, she served us tiny cups of umami-rich hand-rolled green tea. Then we tripped into her tea house for our second tea ceremony of the day, more formal than the previous one at Seisho Yuen. 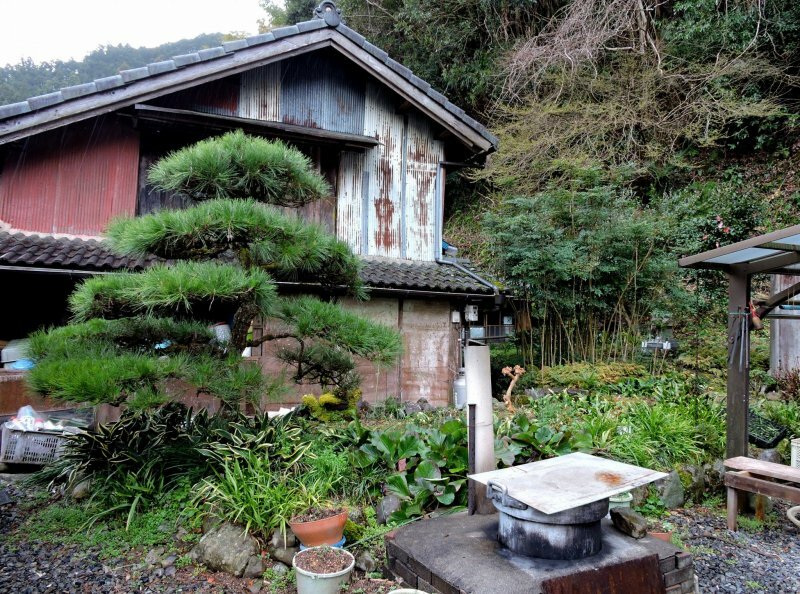 Since I planned to enjoy a "farm stay" with the Nishiyamas, my traveling companions departed, and I settled into a large tatami room heated by a cozy oil stove, complete with a friendly cat. The first item on the agenda was a green tea bath. The bathroom was small and cluttered, but the bath was large, and the water was hot and green. Apparently, green tea is great for your skin too! 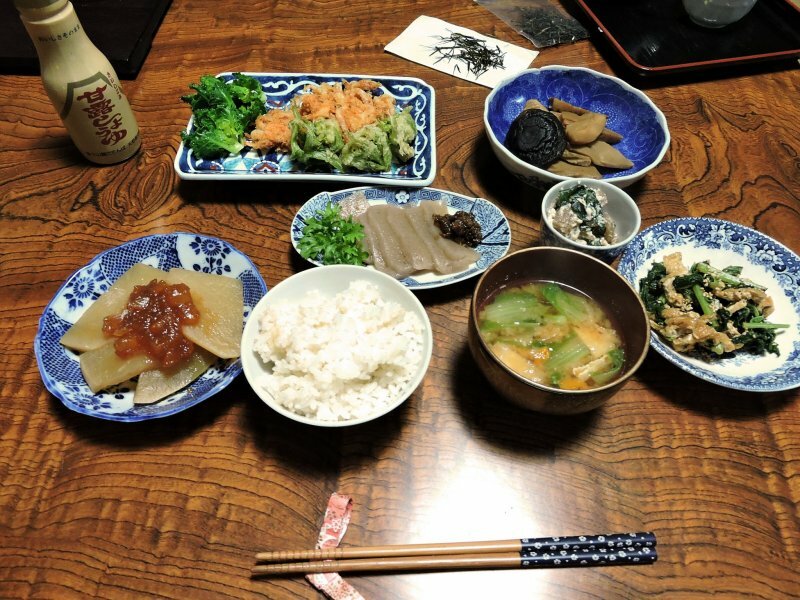 After my bath I enjoyed a typical Japanese meal with many small dishes of different foods, all prepared by my hostess. There were organically grown vegetables, and everything was healthy and really delicious. Except for some shrimp tempura, the meal would have been suitable for a vegetarian. I showed my appreciation by eating every last scrap of food. I slept well on a cotton-filled futon and woke to morning light filtering through the papered sliding doors. Breakfast was almost as impressive as dinner, then I went for a walk to see the tea fields before I left. 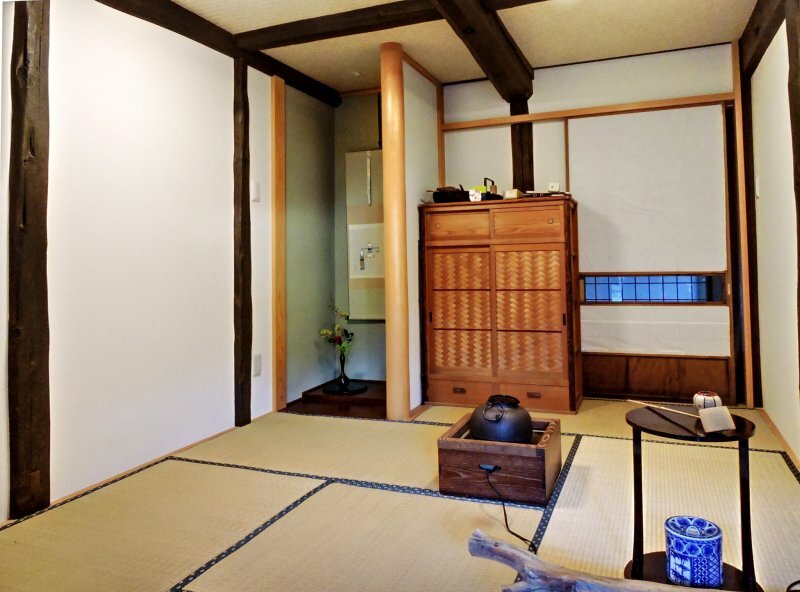 Depending on when you visit, a farm-stay at Nukumori-en Yururi can include many different activities including tea picking, making miso, and - of course - tea ceremony. 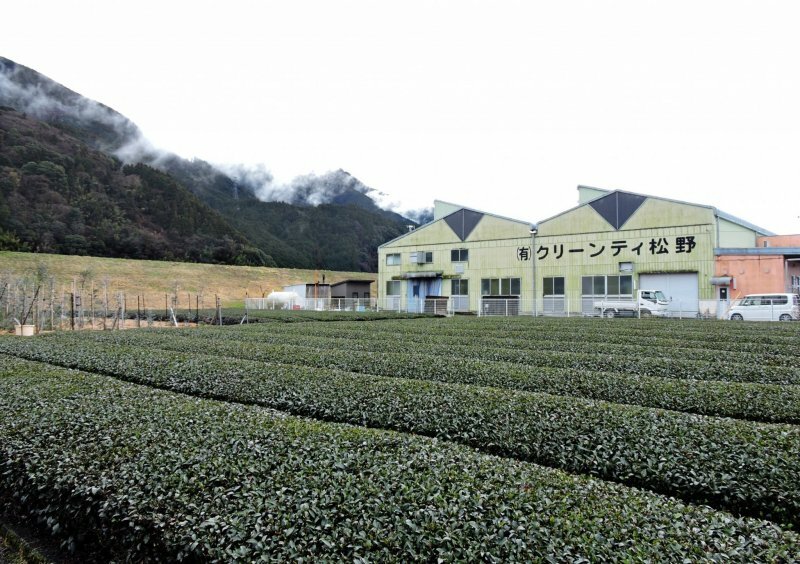 The best thing for me, however, was chatting with Nishiyama-san and getting a glimpse into the busy, productive and healthy lifestyle of a Shizuoka tea farm. Nukumori-en Yururi is about 20 minutes by taxi from Okitsu Station on JR Tokaido Line. 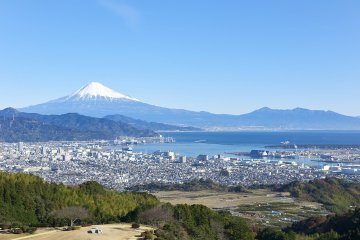 If you can speak some Japanese, you can certainly enjoy all of the above locations. However, if you can't speak Japanese or want to understand the details better, you can use certified guides from Fujinokuni Shizuoka Interpreters' Organization, who (currently) speak English, Chinese, French, Korean, Portuguese, Spanish, or Thai. You should book a guide well in advance. You will need to pay for travel, admission and meal expenses, but having a Japanese person to explain things can add a lot to your enjoyment. It takes 60 minutes on the Hikari shinkansen and 90 minutes on the Kodama Shinkansen from Tokyo Station to Shizuoka Station. From there you can connect with the JR Tokaido Line, taxis and buses. I came to Japan in 2003 to teach English. I lived in Shiga prefecture for one year, and it still holds a special place in my heart. I lived in Kyoto for nine years, then moved to Machida, Tokyo in 2014 after meeting my Japanese partner. 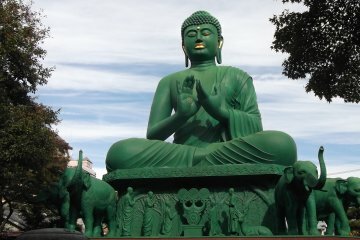 I love to take photos, and my Japan in Pictures Facebook page has some 40,000 followers. 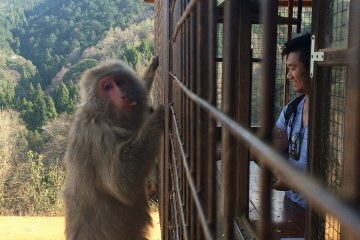 I have been the Regional Partner for Yamanashi Prefecture since 2014. 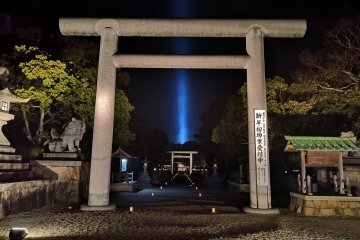 I am enjoying exploring the prefectures around Tokyo (I like to get off the beaten track), and I hope the photos and stories I share will encourage more people to discover this wonderful country. 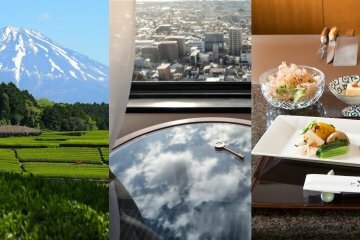 Discover Shizuoka, stay at Hotel.. The Best Places for Exploring.. Yes, it was beautiful. Everything about that place was perfect! 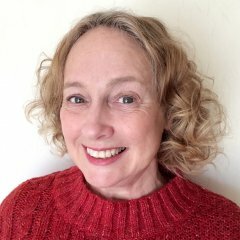 I've really enjoyed your recent tea articles! I'm living vicariously through them!